Most of us are either more predisposed toward contemplation or action. As with most subjective ideologies, whichever one we prefer is the most correct one. Funny how that work, isn't it. But truthfully, there is an essential relationship between contemplation and action that helps us live in the sweet spot of intentionality and effectiveness. We all want to thrive and when we figure out the relationship between contemplation and action, and implement a strategy to live in that balance, we can each truly flourish. I've been on a life-long journey to discover the best task-management system to find that balance, and I'd love to share some of what I've learned—and am learning—with you. But, let me offer a huge preface before continuing. Please don't read any of this as prescriptive. I get so fatigued reading all of the universally prescribed "wisdom" that's on the interwebs. This is my subjective opinion, and it is fallible. But maybe this framework will be a helpful guide as you discover your own best-practice thinking for thriving in 2018. I have never found the perfect organization system to move ideas to action. What you'll see below is a combination of a few practices that other people—much smarter than me—have come up with. I've created a bastardized version that works best in my routine. A few years ago I stumbled onto a task list organization process called Bullet Journal. I loved the process they recommended and quickly implemented this practice, with a few minor preference adjustments. It's the best mechanism I've found to check tasks off the list and keep myself organized. It worked really effectively for a while, but I started to notice that my weekly process was missing some of the intentionality and goal driven action I desired. intentionality in my own life is a brilliant guy named Sean Johnson. If you don't follow him, start now here. I promise you'll thank me later. He actually put into practice the system of Getting Things Done and his diligence has really paid off. He has helped a lot of people implement this effective strategy and built a deck with the basics of it here. Long story short, Sean inspired me to walk back through Allen's system and evaluate what aspects of the GTD process could benefit my life, and I'm so glad I did. What you see below is the hybrid self-leadership system that I use each week. I'll quickly walk through the 6 sections of my weekly process, and if I miss any details that would be helpful please feel free to reach out with any questions. As I said earlier, this is not meant to be prescriptive, just see if any of the concepts resonate, apply what works for you, and disregard the rest. And whether any of this is helpful or not, choose to make 2018 your most intentional and effective year yet. You've got this! *The info below is an amalgamation (I love that word!) of the last few weeks of my journal sections, rather than the actual work for this one week. It has also been edited to remove any thoughts, notes or processes covered in NDAs with client companies. I have tried every task list manager and journal imaginable—from really cheap options and mobile apps to ridiculously expensive integrated systems. For me, all that research and experimentation has led me to the simplest solution: a Moleskine, classic hard cover (5x8.25), sapphire blue, squared journal. Available for about $16 on Amazon Prime here. I love everything about Moleskine with one exception: I think there's a correct way to pronounce it and I'm not cool enough to know it. This work-horse of a journal has never failed me. 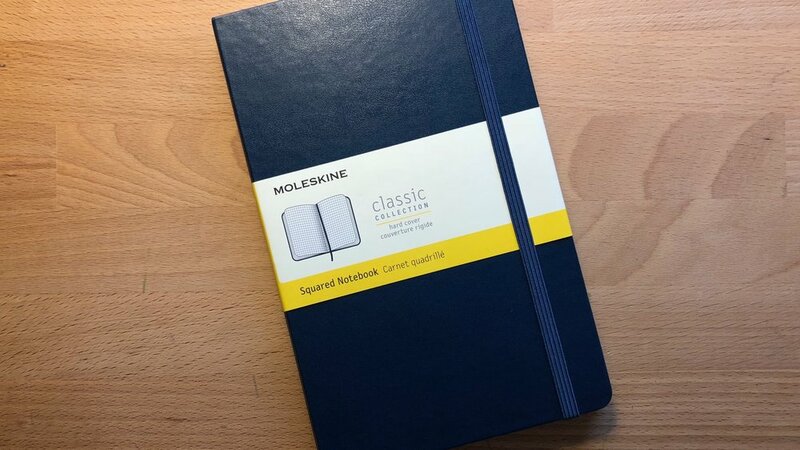 As an aside, I choose the sapphire blue version because everyone else I know who uses Moleskine chooses black and it gets really confusing to remember which is yours on a conference table filled with black journals. Also, the color blue makes me happy. 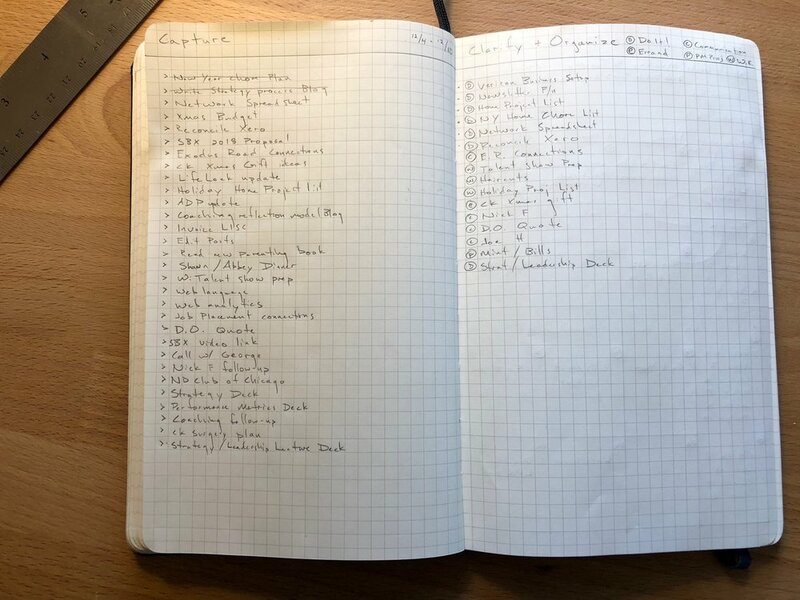 The Capture section of my journal is a brain dump of any idea, project, thought or insight I have throughout the week. I also use my email inbox for jotting quick notes to myself, and then transfer those into this section of the journal. Once the note is moved into the next section of the process, I simply draw a light line through it and never think about it again. That's the whole purpose of the Capture section, to get ideas on paper and out of your head. There's no wrong answer and items shouldn't be evaluated for worth or applicability yet. Just write 'em down. When I move action items from the Clarify + Organize section to the next one I simply put a small dot in front of that activity so I don't have to think about it again. I also have a category in this section that is designated with an arrow ">" symbol. This is my reminder to "push" this item into a future week, or designate a separate page in my journal to unpack this idea further. That's the Clarify aspect of this page. As I prioritize and process urgency, the push symbol allows me to recognize that it can wait, or I may just need some more time to percolate on that idea before acting. This third section is like a calendar for my focus and execution. I move the action items for this week from the Clarify + Organize section into this strategic map of intentional activity. In the top left I list out the big-picture strategic goals for my week to be sure I stay aware of them. The next section of this page is a column for each day of the week. At the top is a section for any unique activities or responsibilities that day. Really, anything that will define some aspect of my schedule or focus. 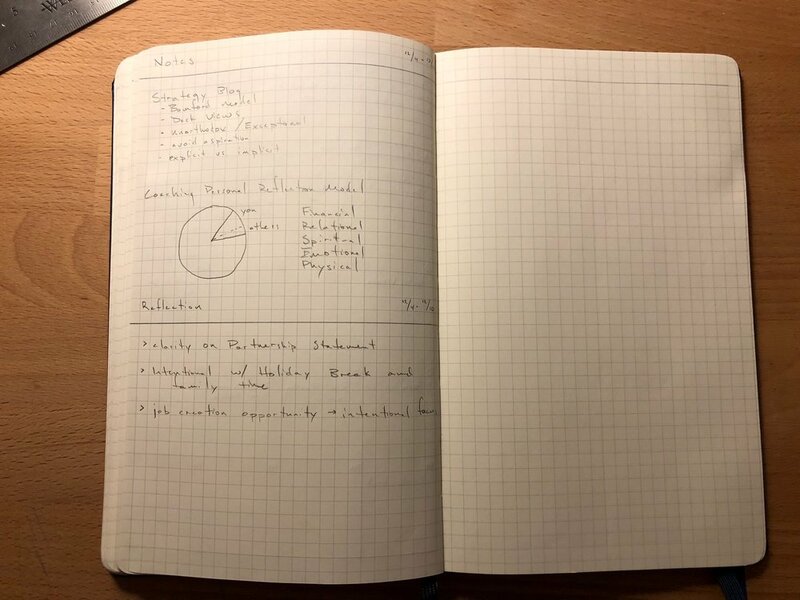 The next section—labeled Action above—is a Bullet Journal style list of the activities that have been transferred from the Clarify + Organize section. Each item has a small dot placed in the box before it that acts as a bullet point and also a key for showing progress and status. Unlike the people section of this page, the numbers 1 and 2 in this section do define prioritization. Tier 1 activities are prioritized above tier 2, as you obviously assumed. Then, the PM section is a place to put projects that will get my attention in the evening. This is often where I put personal projects, ideas I need to research that don't fit into the normal work day, and of course... calling my mom. The final section of each column is labeled FU. While these letters represent a place to record Follow-Up activities, this specific abbreviation serves both that purpose and gives me a chuckle every time I write it. I realize the matrix of this section looks like a pain to draw, but it's really quick and easy with my handy ruler. At this point it takes me about 5 minutes to do, and I've found that preparing this 6 page process each week is a part of the reflection and contemplation that helps me live with greater intentionality. This section is where the real learning and innovation happens each week. This is the space to capture thoughts or meeting notes and reflect on big-ideas that I want to dive into further. No rules on these sections, just mining for the gold of a productive week. In the same way that preparing the journal is contemplation, spending time at the end of the week reflecting on key ideas and learnings is incredibly important. Truth be told, I rarely use this page. Not to be too cheesy, but it's a tangible reminder to me each week to build margin into my life. Have an extra page at the end in case you need it. Leave a few extra minutes between meetings to reflect, prepare for what's next, or connect with a co-worker. Shut off the device to give my wife and kids my full attention for 3 hours at night. Margin is good. Margin helps us become more patient people. Margin makes us drive smarter, instead of carelessly hurrying to the next thing all the time. Life can be filled with intentional activity and we can each thrive in our pursuits, and all of that can be done while we also remember to take the time to breath.